"Within You Without You" is a song by the English rock band the Beatles from their 1967 album Sgt. Pepper's Lonely Hearts Club Band. Written by lead guitarist George Harrison, it was Harrison's second composition in the Indian classical style, after "Love You To", and was inspired by his stay in India in late 1966 with his mentor and sitar teacher, Ravi Shankar. Recorded in London without the other Beatles, the song features Indian instrumentation such as sitar, dilruba and tabla, and was performed by Harrison and members of the Asian Music Circle. The recording marked a significant departure from the Beatles' previous work; musically, it evokes the Indian devotional tradition, while the overtly spiritual quality of the lyrics reflects Harrison's absorption in Hindu philosophy and the teachings of the Vedas. The song was Harrison's only composition on Sgt. Pepper, although his endorsement of Indian culture was further reflected in the inclusion of yogis such as Paramahansa Yogananda among the crowd depicted on the album cover. With the worldwide success of the album, "Within You Without You" presented Indian classical music to a new audience in the West and contributed to the genre's peak in international popularity. It also influenced the philosophical direction of many of Harrison's peers during an era of utopian idealism marked by the Summer of Love. The song has traditionally received a varied response from music critics, some of whom find it lacklustre and pretentious, while others admire its musical authenticity and consider the message to be the most meaningful on Sgt. Pepper. Writing for Rolling Stone, David Fricke described the track as being "at once beautiful and severe, a magnetic sermon about materialism and communal responsibility in the middle of a record devoted to gentle Technicolor anarchy". For the Beatles' 2006 remix album Love, the song was mixed with the John Lennon-written "Tomorrow Never Knows", creating what some reviewers consider to be that project's most successful mashup. Sonic Youth, Rainer Ptacek, Oasis, Patti Smith, Cheap Trick and the Flaming Lips are among the artists who have covered "Within You Without You". George Harrison began writing "Within You Without You" in early 1967 while at the house of musician and artist Klaus Voormann, in the north London suburb of Hampstead. Harrison's immediate inspiration for the song came from a conversation they had shared over dinner, regarding the metaphysical space that prevents individuals from recognising the natural forces uniting the world. Following this discussion, Harrison worked out the song's melody on a harmonium and came up with the opening line: "We were talking about the space between us all". 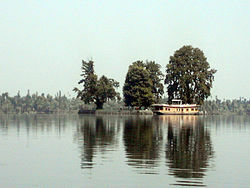 Dal Lake in Kashmir – part of the "pure essence of India" that Harrison said he experienced in 1966 and inspired the song. The song was Harrison's second composition to be explicitly influenced by Indian classical music, after "Love You To", which featured Indian instruments such as sitar, tabla and tambura. Since recording the latter track for the Beatles' Revolver album in April 1966, Harrison had continued to look outside of his role as the band's lead guitarist, further immersing himself in studying the sitar, partly under the tutelage of master sitarist Ravi Shankar. Harrison said that the tune for "Within You Without You" came about through his regularly performing musical exercises known as sargam, which use the same scales as those found in Indian ragas. "Within You Without You" is the first of many songs in which Harrison espouses Hindu spiritual concepts in his lyrics. Having incorporated elements of Eastern philosophy in "Love You To", Harrison became fascinated by ancient Hindu teachings after he and his wife, Pattie Boyd, visited Shankar in India over September–October 1966. Intent on mastering the sitar, Harrison first joined other students of Shankar's in Bombay, until local fans and the press learned of his arrival. [nb 1] Harrison, Boyd, Shankar and the latter's partner, Kamala Chakravarty, then relocated to a houseboat on Dal Lake in Srinagar, Kashmir. There, Harrison received personal tuition from Shankar while absorbing religious texts such as Paramahansa Yogananda's Autobiography of a Yogi and Swami Vivekananda's Raja Yoga. [nb 2] This period coincided with his introduction to meditation and, during their visit to Vrindavan, he witnessed communal chanting for the first time. Harrison and Boyd returned to England on 22 October, and continued to adhere to a Hindu-aligned lifestyle of yoga, meditation and vegetarianism at their home in Esher. [nb 3] The education Harrison received in India, particularly regarding the illusory nature of the material world, resonated following his experiences with the hallucinogenic drug LSD (commonly known as "acid") and informed his lyrics to "Within You Without You". Having considered leaving the Beatles after the completion of their third US tour, on 29 August 1966, he instead gained a philosophical perspective on the effects of the band's international fame. [nb 4] He later attributed "Within You Without You" to his having "fallen under the spell of the country" after experiencing the "pure essence of India" through Shankar's guidance. "Within You Without You" was a song that I wrote based upon a piece of music of Ravi [Shankar]'s that he'd recorded for All-India Radio. It was a very long piece – maybe thirty or forty minutes ... I wrote a mini version of it, using sounds similar to those I'd discovered on his piece. The song follows the pitches of Khamaj thaat, the Indian equivalent of Mixolydian mode. Written and performed in the tonic key of C (but subsequently sped up to C♯ on the official recording), it features what musicologist Dominic Pedler terms an "exotic" melody over a constant C-G "root-fifth" drone, which is neither obviously major nor minor in scale. Based on a musical piece that Shankar had written for All India Radio, the structure of the composition adheres to the Hindustani musical tradition and demonstrates Harrison's advances in the Indian classical genre since "Love You To". Following a brief alap, which serves to introduce the song's main musical themes, "Within You Without You" comprises three distinct sections: two verses and a chorus; an extended instrumental passage; and a final verse and chorus. The alap consists of tambura drone, over which the main melody is outlined on dilruba, a bow-played string instrument that Boyd began learning in India. Throughout the vocal section of the song – the gat, in traditional Indian composition – the rhythm is a 16-beat tintal in madhya laya (medium tempo). The vocal line is supported throughout by dilruba, in the manner of a sarangi echoing the melody in a khyal piece. The first three words of each verse ("We were talking") have a tritone interval (E to B♭), which, in Pedler's view, enhances the spiritual dissonance that Harrison expresses in his lyrics. 4 time, first between the dilruba and sitar, then between a Western string section and sitar. The interplay between these lead instruments adheres to the call-and-response tradition of Indian classical music, known as jawab-sawal. The passage resolves in melodic unison as the instruments together state a rhythmic cadence, or tihai, to close the middle segment. After this, the drone is again prominent as the rhythm returns to 16-beat tintal for the final verse and chorus. On the finished recording, the tonal and spiritual tension is relieved by the inclusion of muted canned laughter. In his book Indian Music and the West, Gerry Farrell writes of "Within You Without You": "The overall effect is of several disparate strands of Indian music being woven together to create a new form. It is a quintessential fusion of pop and Indian music." Peter Lavezzoli, author of The Dawn of Indian Music in the West, describes the song as "a survey of Indian classical and semiclassical styles" in which "the diverse elements ... are skillfully woven together into an interesting hybrid. If anything, the closest comparison that might be made is to the Hindu devotional song form known as bhajan." Harrison (pictured in the Hindu holy city of Vrindavan in 1996) drew from Vedanta philosophy for the first time in his lyrics to "Within You Without You". According to Religion News Service writer Steve Rabey, "Within You Without You" "contrast[s] Western individualism with Eastern monism". The lyrics convey basic tenets of Vedanta philosophy, particularly in Harrison's reference to the concept of maya (the illusory nature of existence), in the lines "And the people who hide themselves behind a wall of illusion / Never glimpse the truth". Author Joshua Greene paraphrases the song-wide message as: "A wall of illusion separates us from each other ... which only turns our love for one another cold. Peace will come when we learn to see past the illusion of differences and come to know that we are one ..." The solution espoused by Harrison is for individuals to see beyond the self and each seek change within, further to Vivekananda's contention in Raja Yoga that "Each soul is potentially divine. The goal is to manifest that divinity ..." According to ethnomusicologist David Reck, aside from the reference to maya, the lyrics convey Indian philosophical concepts such as advait (the one essential reality), satya (perception of truth) and, in the line "With our love we could save the world", universal love. At times in the song, Harrison distances himself from those who live in ignorance of these apparent truths – saying, "If they only knew" and asking the listener, "Are you one of them?" In the final verse, he quotes from the gospels of St Matthew and St Mark, lamenting those who "gain the world and lose their soul". Author Ian MacDonald defends the "accusatory finger" behind such statements, saying that, within the ideology of the emerging 1960s counterculture, "this is a token of what was then felt to be a revolution in progress: an inner revolution against materialism". The transcendental theme of Harrison's lyrics aligned with the philosophy behind the 1967 Summer of Love – namely, the search for universality and an ego-less existence. Author Ian Inglis considers the line "With our love we could save the world" to be a "cogent reflection" of the Summer of Love ethos, anticipating the utopian message of Harrison's composition "It's All Too Much" and the John Lennon-written "All You Need Is Love". He adds, with reference to the chorus: "The lyrics are given greater depth by the double meaning of without – 'in the absence of' and 'outside' – each of which is perfectly applicable to the song's sentiments." Harrison recorded "Within You Without You" for the Beatles' Sgt. Pepper's Lonely Hearts Club Band, an album based around Paul McCartney's vision of a fictitious band that would serve as the Beatles' alter egos, after their decision to quit touring. Harrison had little interest in McCartney's concept; he later admitted that, following his return from India, "my heart was still out there", and working with the Beatles again "felt like going backwards". Harrison presented the song after it was decided to exclude his composition "Only a Northern Song", which the Beatles recorded in February 1967. In contrast to his prominence as a songwriter on Revolver, "Within You Without You" was Harrison's sole composition on Sgt. Pepper. George has done a great Indian one. We came along one night and he had about 400 Indian fellas playing there ... it was a great swinging evening, as they say. The recording features musical contributions from only Harrison, Beatles aide Neil Aspinall, and a group of London-based Indian musicians. As with his Indian accompanists on "Love You To", Harrison sourced these contributors through the Asian Music Circle in north London. Harrison missed a Beatles recording session to attend one of Shankar's London concerts, an absence that served as part of his preparation for recording "Within You Without You". The session was also attended by Lennon, artist Peter Blake, and John Barham, an English classical pianist and student of Shankar who shared Harrison's desire to promote Indian music to Western audiences. In Barham's recollection, Harrison "had the entire structure of the song mapped out in his head" and sang the melody that he wanted the dilruba player to follow. The twin hand-drums of the tabla were close-miked by recording engineer Geoff Emerick, in order to capture what he later described as "the texture and the lovely low resonances" of the instrument. The bow-played dilruba features prominently throughout the song. The first of two overdubbing sessions for "Within You Without You" took place at Abbey Road on 22 March. Two more dilruba parts were added that day, after which a reduction mix was carried out, to allow for further overdubs onto the four-track recording. Producer George Martin then arranged the string orchestration, for eight violins and three cellos, based on Harrison's instructions. The pair worked hard together on the arrangement, ensuring that Martin's score imitated the slides and bends of the dilrubas. [nb 8] The orchestral parts, performed by members of the London Symphony Orchestra, were added on 3 April. During the same session, Harrison recorded his vocal and a sitar part, the solo of which, in the description of music critic David Fricke, "sings and swings with the clarity and phrasing of his best rockabilly-fired guitar work". [nb 9] Harrison also overdubbed occasional interjections on acoustic guitar. On 4 April, while preparing the final mixes of the song, in stereo and mono, Harrison added crowd laughter taken from a sound effects tape in the Abbey Road library. Martin and Emerick were both opposed to this addition but deferred to Harrison, who later said that the laughter provided "some light relief", adding: "You were supposed to hear the audience anyway, as they listen to Sergeant Pepper's Show." The completed recording was enhanced in the mixes through the liberal application of automatic double tracking. Before Harrison recorded his vocals the previous day, the track had been edited and then sped up so that its length was reduced from 6:25 to 5:05. In the process, the song's key was raised a semitone, to C♯. Harrison's Māyan discourse [in "Within You Without You"] establishes the firmament for the Beatles' utopian sentiments that ultimately propel the Summer of Love into being: "With our love we could save the world," Harrison sings. Sgt. Pepper's Lonely Hearts Club Band was released on 26 May 1967, with "Within You Without You" sequenced as the opening track on side two of the LP. Greene notes that for many listeners at the time, the song provided their "first meaningful contact with meditative sound". In his 1977 book The Beatles Forever, Nicholas Schaffner likened "Within You Without You" to Hermann Hesse's Siddhartha – an influential novel among the counterculture during the Summer of Love – in terms of the song's evocation of Hesse's "idealization of individuality" and "vision of a mysterious East". Eager to separate the song's message from the LSD experience at a time when the drug had grown in popularity and influence, Harrison told an interviewer: "It's nothing to do with pills ... It's just in your own head, the realisation." Although Harrison later spoke dismissively of the Sgt. Pepper project and its legacy,[nb 10] he conceded that he had enjoyed working on the record's iconic cover. For this, he asked Blake to include pictures of four Indian yogis – Yogananda, Mahavatar Babaji, Lahiri Mahasaya and Sri Yukteswar – among the crowd surrounding the Beatles; as a further Indian detail, a four-armed idol of the Hindu goddess Lakshmi was placed in the garlands of flowers at the bottom of the image. Among the song's lyrics, printed on the back cover, the positioning of the words "Without You" beside McCartney's head served as a clue in the Paul Is Dead rumour, which grew in the United States partly as a result of the Beatles' failure to perform live after 1966. In 1971 the song was issued as the title track of an EP release in Mexico. Part of a series of Beatles releases sequenced by Lennon, the EP also included the Harrison-written tracks "Love You To", "The Inner Light" and "I Want to Tell You". In 1978 "Within You Without You" appeared as the B-side to the "Sgt. Pepper's Lonely Hearts Club Band"/"With a Little Help from My Friends" medley, on singles released in West Germany and some other European countries. An instrumental version of the track, at the original speed and in the key of C, appeared on the Beatles' 1996 outtakes compilation Anthology 2. Recalling the song's release in his book The Beatles Diary, Barry Miles writes: "Some thought it a masterpiece, some a prime example of mock-philosophical babble. Either way, it was pure Harrison." David Griffiths of Record Mirror praised the album's musical and lyrical scope, which included "life-enhancing philosophy", and added: "George Harrison's 'Within You Without You' is a beautifully successful and adventurous statement in song of a Yoga truth." The Times of India's music critic similarly admired the Beatles for "explor[ing] farther reaches in the musical firmament" and described Harrison's composition as a "memorable" track. In one of the few unfavourable reviews for Sgt. Pepper, Richard Goldstein, writing in The New York Times, said the song was "remarkable" musically and a highlight of the album, yet he considered the lyrics "dismal" and full of "the very clichés the Beatles helped bury". [nb 11] Allen Evans of the NME found the "deep, rich rhythm" of the tabla "most appealing", although he bemoaned that it was difficult to decipher the lyrics "because they merge with the sitar music so closely". According to the Beatles' official biographer, Hunter Davies, writing in 1968, some contemporary reviewers speculated that the burst of laughter at the end of "Within You Without You" was inserted by Harrison's bandmates to mock the song. Davies corrected this misconception, saying: "It was completely George's idea. "[nb 12] In a review published five months after the release of Sgt. Pepper, Hit Parader considered that the album had not endured as well as the Beatles' previous works, and opined: "Harrison has produced a soothing, sinuous, exotic sound for 'Within You Without You'. But even though his repetitious recitation of elementary Far Eastern philosophy is probably intended to reflect the infinity of the universe, it soon becomes a bit monotonous. The laughter at the end seems to be deflating the pretentiousness of the lyrics." The song has continued to invite widely diverse opinions. Among the most unfavourable assessments, author and critic Tim Riley, writing in 1988, dismissed "Within You Without You" as "directionless", adding that it was difficult to conceive how "lines such as 'Life flows on within you and without you' were taken seriously". He also said that the song was "the most dated piece on the record ... [and] could easily have been left off with little to no effect" on the album. In a 2009 review, Alex Young of Consequence of Sound grouped it with the "major clunkers" on Sgt. Pepper. Conversely, Ian Inglis considers the song to be "absolutely central to the form and content" of its parent album, and Ian MacDonald views it as the "conscience" of Sgt. Pepper and "the necessary sermon that comes with the community singing". [nb 13] Musicologist Russell Reising writes that Harrison's song provides the exception on Sgt. Pepper, where the Beatles otherwise "retreated lyrically into predominantly banal, occasionally schmaltzy, and often trivial vignettes". Author and critic Kenneth Womack terms it "quite arguably, the album's ethical soul". Writing for Rough Guides, Chris Ingham admires the track as "beautifully put together"; he describes it as both "some of the most exotic music released under The Beatles' name" and a "philosophical meditation on life and love beyond self ... [that], once surrendered to, is a central part of the Pepper experience". In his book on the history of ambient music, Mark Prendergast includes "Within You Without You" among the album's "three outstanding cuts" and deems it to be "the most timeless piece of dronal psychedelia ever recorded". AllMusic critic Richie Unterberger admires the melody, but he considers the track overlong and notes the potential for offence in this, "the first Beatles song where [Harrison's] Indian religious beliefs affected the lyrics with full force". Sgt. Pepper is about Britain, and the Summer of Love was always about America. The only song on the album that approaches the ideology and rhetoric of the hippie counterculture was George Harrison's sole contribution, the lush sitar-washed "Within You Without You", and it follows that Harrison was the only Beatle to have visited Haight-Ashbury at the peak of the scene. Even then, Eastern philosophy informed the lyric more deeply than did acid culture, and it's still a dense and stunning composition no matter its ideology. Writing for Rolling Stone in 2002, David Fricke included "Within You Without You" on his list of the "25 Essential Harrison Performances". He described it as, variously, the Beatles' "purest excursion ... into raga", and "at once beautiful and severe, a magnetic sermon about materialism and communal responsibility in the middle of a record devoted to gentle Technicolor anarchy". In his review of the 50th anniversary edition of Sgt. Pepper for the same publication, Mikal Gilmore said that only "Within You Without You" and Lennon's "A Day in the Life" transcend the album's legacy as "a gestalt: a whole that was greater than the sum of its parts". In 2018, "Within You Without You" was ranked at number 50 on a list of the best Beatles songs, as compiled by the music staff of Time Out London. Sgt. Pepper's "Within You, Without You" exemplified the transformation – a transfusion of Indian melody and instrumentation that captured the zeitgeist of millions of freaky young 'uns sitting around discussing consciousness. Needless to say, sitar sales skyrocketed, as did the demand for gurus. According to New Yorker journalist Mark Hertsgaard, the lyrics to "Within You Without You" "contained the album's most overt expression of the Beatles' shared belief in spiritual awareness and social change". Harrison's espousal of Eastern philosophy dominated the group's extracurricular activities by mid 1967, and his influence within the band continued to increase. This led to the Beatles' endorsement of Transcendental Meditation and their highly publicised attendance at Maharishi Mahesh Yogi's spiritual retreat in Rishikesh, India, early the following year. Aided by the Beatles' song, the sitar, and Indian classical music generally, reached its peak in popularity in the West in 1967. Music critic Ken Hunt describes the song as an "early landmark" in Harrison's championing of Shankar, and Indian classical music generally, which gained "real global attention" for the first time through the Beatle's commitment. [nb 17] Peter Lavezzoli also highlights the effect of Sgt. Pepper and its "spiritual centerpiece ['Within You Without You']" on Shankar's popularity, during a year that served as "the annus mirabilis" for Indian music and "a watershed moment in the West when the search for higher consciousness and an alternative world view had reached critical mass". In his Harrison obituary for Salon.com, in December 2001, Ira Robbins considered "Within You Without You" to be "the song that most clearly articulated his devotion, both artistic and philosophical, to India", with a lyric that "pairs worldview and personality in lines that now seem prophetic". Writing in 2013, ethnomusicologist Jeﬀrey Cupchik said that Harrison's Indian-influenced songs, particularly "Within You Without You", "marked the inception of a new 'hybridic' East–West style of music composition – a style that is immensely widespread today". Musicologist Walter Everett lists Spirit's "Mechanical World" and the Incredible String Band's "Maya", both released in 1968, and much of the Moody Blues' 1969 album To Our Children's Children's Children as works that were directly influenced by the song. Dead Can Dance's 1996 album Spiritchaser includes the track "Indus", the melody of which was found to be very similar to that of "Within You Without You". The duo's singer, Lisa Gerrard, told The Boston Globe that they had obtained Harrison's blessing but "the [record company] pushed it", with the result that they were forced to give the former Beatle a partial songwriting credit. In their 1978 television film satirising the Beatles' history, All You Need Is Cash, the Rutles parodied "Within You Without You" on the track "Nevertheless", performed by Rikki Fataar in the role of Stig O' Hara. [nb 18] Harrison himself included musical quotations from "Within You Without You" in his 1987 song "When We Was Fab" and in the instrumental "Marwa Blues", released in 2002 on his final studio album, Brainwashed. Coinciding with the 50th anniversary of Sgt. Pepper's Lonely Hearts Club Band, the Royal Liverpool Philharmonic Orchestra (RLPO) staged an event titled "George Harrison 'Within You Without You': The Story of The Beatles and Indian Music" at the Liverpool Philharmonic Hall. While carrying out research for this project, academics from the University of Liverpool and the University of Sheffield discovered the identity of the Indian musicians on the 1967 recording. The two surviving players, Buddhadev Kansara and Natwar Soni, were among the performers at the RLPO event. "Within You Without You" was included on the 2006 remix album Love, which was created for the Cirque du Soleil stage show of the same name. Harrison's vocal appears over the rhythm section from "Tomorrow Never Knows", after the track opens with Lennon's lyric from the latter song. Reviewing the album for PopMatters, Zeth Lundy writes: "The 'Within You Without You'/'Tomorrow Never Knows' mash-up, perhaps the most thrilling and effective track on the entire disc, fuses two especially transcendental songs into one: ... a union of two ambiguous, open-ended declarations of spiritual pursuit. "[nb 19] Paul Moody of Uncut similarly considers it to be the "best of all" the mashups on Love, with the two tracks' "cosmic drones ... fitted together like a glove". In their chapter on the Beatles' psychedelic period in The Cambridge Companion to the Beatles, authors Russell Reising and Jim LeBlanc describe "Within You Without You/Tomorrow Never Knows" as "the most musically and visually stunning segment" of the Cirque du Soleil show. Remixed and remastered by George Martin and his son Giles, "Within You Without You"/"Tomorrow Never Knows" was the first track prepared for Love. Speaking to Mojo magazine in December 2006, Giles Martin said that he had first created a demo combining the two songs, which he then nervously presented to McCartney and Ringo Starr for their approval. In Martin's recollection, "they loved it", which allowed the project to proceed. A video clip of the completed track was made to promote the album and was included on the 2015 DVD 1+. The Love remix is one of the songs in The Beatles: Rock Band. Big Jim Sullivan, a British session guitarist who became proficient on the sitar, included "Within You Without You" on his album of Indian music-style recordings, titled Sitar Beat and first released in 1967. In the same year, the Soulful Strings recorded the song for their album Groovin' with the Soulful Strings, a version that also appeared on the B-side of their most successful single, "Burning Spear". A 1988 cover version by Sonic Youth (pictured performing in 2005) transformed "Within You Without You" into a rock song, complete with guitar feedback. In 1988, Sonic Youth recorded "Within You Without You" for the NME's multi-artist tribute Sgt. Pepper Knew My Father. Fricke highlights this recording as an example of how, regardless of its Indian origins, the composition can be interpreted on electric guitar effectively and "with transportive force". In 2007, the staff of the New York pop culture website Vulture placed Sonic Youth's version at number 2 in their list titled "Our Ten Favorite Beatles Covers of All Time". Big Daddy covered the song on their 1992 Sgt. Pepper tribute album, a release that Moore recognises as "the most audacious" of the many interpretations of the Beatles' 1967 LP. Moore says that "Within You Without You" serves as the album's "cleverest pastiche", performed in a free jazz style reminiscent of Ornette Coleman or Don Cherry. Other acts who have covered the song for Sgt. Pepper tributes include Oasis, on a BBC Radio 2 project celebrating the album's 40th anniversary (2007); Easy Star All-Stars (featuring Matisyahu), on Easy Star's Lonely Hearts Dub Band (2009); Cheap Trick, on their Sgt. Pepper Live DVD (2009); and the Flaming Lips, with featured guests Birdflower and Morgan Delt, on With a Little Help from My Fwends (2014). A recording by Big Head Todd and the Monsters appeared on the 2003 Harrison tribute Songs from the Material World. Guitarist Rainer Ptacek opened his 1994 album Nocturnes with what AllMusic critic Bob Gottlieb describes as a "stunning instrumental" reading of the song, recorded live in a chapel in Tucson, Arizona. Writing for the same website, Brian Downing considers a 1997 version by Ptacek, released on his posthumous album Live at the Performance Center, to be "perhaps one of the best unheralded Beatles covers of all time". Patti Smith included it on her 2007 covers album Twelve, a version that, according to BBC music critic Chris Jones, "sounds like [the song] could have been written for her". Other artists who have recorded "Within You Without You" include Peter Knight and his Orchestra, Firefall, Glenn Mercer of the Feelies, Angels of Venice and Thievery Corporation. ^ In an attempt to disguise his identity, at Shankar's suggestion, Harrison had grown a moustache – a change of image that the other Beatles would follow by the end of 1966. ^ Shankar entrusted much of Harrison's tuition in Bombay to his protégé Shambhu Das, who also accompanied the party to Dal Lake. ^ On 26 October that year, at Heathrow Airport, the British press reported on the incongruous sight of Harrison, in traditional Indian clothes, greeting the newly arrived Shankar, who was dressed in a Western suit. ^ Referring to Harrison's maturation, music journalist Neil Spencer wrote in 2002: "It wasn't just India, its music, and his new-found enthusiasm for religion and philosophy. Now he knew how it felt not to be a Beatle. None of the others had that." ^ Lavezzoli similarly considers the 5/4-time instrumental segment to be "by far the most radical departure from the normal stylistic parameters of a Beatles recording". ^ The identity of the Indian players remained unknown for several decades. Research undertaken by the University of Liverpool's Department of Music has since identified four of the musicians as Anna Joshi, Amrit Gajjar (both dilruba), Buddhadev Kansara (tambura) and Natwar Soni (tabla). ^ While his contribution as a songwriter was minimal, Harrison added Indian musical styling to several other songs during the sessions for Sgt. Pepper. These include playing swarmandal on "Strawberry Fields Forever" and sitar and tambura on "Lucy in the Sky with Diamonds", which also features a lead guitar part where he imitates a sarangi behind Lennon's vocal line. ^ In the opinion of music journalist Mark Prendergast, the Western strings suggest a Carnatic (or South Indian) quality, contrasting with the song's adherence to the Hindustani (North Indian) musical tradition. ^ While discussing "Within You Without You" in a 1979 interview, Harrison reflected that the song "sounds a bit dopey now in retrospect" but expressed satisfaction with his sitar solo. ^ Speaking in the 1980s about the album's impact, Harrison described it as "a milestone and a millstone in music history". ^ According to Robert Christgau, in his December 1967 column for Esquire magazine, Goldstein was vilified for his views on Sgt. Pepper. Among the many letters sent to The New York Times, one of the most frequent complaints concerned Goldstein's dismissal of the lyrics to "Within You Without You". ^ MacDonald cites Harrison's use of laughter as a key example of the Beatles' propensity for an "undertone of irony ... even in their moments of ostensible decorum". He suggests that this especially Liverpudlian trait was often misunderstood by the band's listeners outside England, particularly those in America. ^ While comparing the song with "All You Need Is Love" – a "transcendental statement" from the Summer of Love that would similarly be misinterpreted in "the materialistic Eighties" – MacDonald opines: "Described by those with no grasp of the ethos of 1967 as a blot on a classic LP, 'Within You Without You' is central to the outlook that shaped Sgt. Pepper – a view justifiable then, as it is justifiable now." ^ In the same letter, Mascaró enclosed a copy of his book Lamps of Fire and suggested that a passage he had translated from the Tao Te Ching might make a suitable subject for a song. Harrison duly used this passage in the lyrics to "The Inner Light", his third fully Indian-styled Beatles track. ^ In a 1973 interview, Lennon said it was his favourite song of Harrison's. Similarly impressed, Ringo Starr said in 2000: "'Within You Without You' is brilliant. I love it." ^ American musician Gary Wright recalls listening to "Within You Without You" repeatedly in the summer of 1967 while touring Europe for the first time, and he says: "I was transported to another place of consciousness. I'd never heard such sound textures before." ^ In his autobiography, Raga Mala, Shankar cites the media's discovery that he was teaching Harrison sitar in Bombay as the cause for his elevated status to that of a "superstar", leading to his high-profile appearances at US rock music festivals such as Monterey (in June 1967) and Woodstock (August 1969). ^ Made with input from Harrison, the film also satirised his spiritual preoccupations as, following the Rutles' break-up, Stig withdraws from the limelight to become a female flight attendant with Air India. ^ The tabla part from "Within You Without You" was used again on Love, mixed into the start of "Here Comes the Sun". The track then segues into a transition piece featuring Indian instrumentation from "The Inner Light". ^ a b Everett 1999, p. 123. "In the United Kingdom, Sgt. Pepper ... was rush-released six days ahead of its official date, June 1". ^ a b The Editors of Rolling Stone 2002, p. 175. ^ a b c d Lewisohn 2005, p. 103. ^ Everett 1999, p. 111. ^ a b The Editors of Rolling Stone 2002, p. 174. ^ a b c Clayson 2003, p. 213. ^ a b Tillery 2011, p. 59. ^ a b Harrison 2002, p. 112. ^ Shankar 1999, p. 195. ^ Everett 1999, pp. 40, 112. ^ Reck 2016, p. 65. ^ Leng 2006, pp. 27–28. ^ Lavezzoli 2006, pp. 175, 176. ^ a b c d e Everett 1999, p. 112. ^ Inglis 2010, pp. 28, 139. ^ Tillery 2011, pp. 59, 87. ^ Rodriguez 2012, pp. 70–71. ^ Clayson 2003, pp. 206–08. ^ Tillery 2011, pp. 56–58. ^ Leng 2006, p. 24. ^ Lavezzoli 2006, p. 177. ^ Boyd 2007, p. 87. ^ Harrison 2002, p. 56. ^ Shankar 1999, pp. 192–93. ^ The Beatles 2000, p. 236. ^ a b Shankar 1999, p. 193. ^ Clayson 2003, p. 222. ^ Boyd 2007, p. 88. ^ Greene 2006, p. 127. ^ Shankar 1999, pp. 193, 195. ^ Tillery 2011, pp. 56–57. ^ Clayson 2003, p. 206. ^ Clarfield, Geoffrey (15 November 2010). "Good enough to teach the Beatles, but not to record". National Post. Retrieved 31 May 2017. ^ Turner 2016, p. 494. ^ Tillery 2011, p. 57. ^ Turner 2016, p. 659. ^ Clayson 2003, p. 208. ^ Tillery 2011, p. 58. ^ Clayson 2003, p. 210. ^ The Beatles 2000, p. 233. ^ Greene 2006, pp. 71–72, 76–77. ^ MacDonald 1998, pp. 189, 386. ^ Spencer, Neil (2002). "Eastern Rising". Mojo Special Limited Edition: 1000 Days That Shook the World (The Psychedelic Beatles – April 1, 1965 to December 26, 1967). London: Emap. pp. 78–79. ^ a b c d e f The Beatles 2000, p. 243. ^ Shankar 1999, pp. 195–96. ^ Pedler 2003, p. 262. ^ a b c d e f g Lavezzoli 2006, p. 178. ^ Leng 2006, pp. 30–31. ^ Pollack, Alan W. (1996). "Notes on 'Within You Without You'". soundscapes.info. Retrieved 28 October 2015. ^ Clayson 2003, p. 201. ^ Everett 1999, pp. 71, 112. ^ Pedler 2003, p. 523. ^ a b c d e f Lavezzoli 2006, p. 179. ^ a b Hannan 2016, p. 55. ^ Lavezzoli 2006, pp. 38, 441. ^ Farrell 1997, p. 185. ^ a b Rabey, Steve (9 October 2011). "George Harrison, 'Living In The Material World'". The Huffington Post. Retrieved 30 October 2015. ^ Allison 2006, pp. 63, 64. ^ Greene 2006, p. 78. ^ Allison 2006, pp. 64, 96. ^ Tillery 2011, pp. 58, 59. ^ a b Reck 2016, p. 69. ^ Allison 2006, p. 96. ^ Harrison 2002, p. 111. ^ Allison 2006, pp. 57, 96. ^ a b c d MacDonald 1998, p. 215. ^ a b c d Ingham 2006, p. 199. ^ Inglis 2010, pp. 10–11, 139. ^ a b Inglis 2010, p. 8. ^ Everett 1999, pp. 99, 100. ^ Ingham 2006, pp. 46–47. ^ Greene 2006, p. 76. ^ The Beatles 2000, pp. 241, 242. ^ MacDonald 1998, pp. 209, 215. ^ Lavezzoli 2006, pp. 176, 178. ^ a b MacDonald 1998, p. 216. ^ MacDonald 1998, pp. 215–16. ^ a b "Unrecognised Sgt. Pepper Indian musicians to perform after being tracked down by Liverpool academic". University of Liverpool. 6 June 2017. Retrieved 12 June 2017. ^ Staff reporter (9 June 2017). "Forgotten Indians in Beatles album tracked". The Telegraph (Calcutta). Retrieved 14 June 2017. ^ Lavezzoli 2006, pp. 178, 179. ^ Hannan 2016, p. 54. ^ Green 2006, pp. 76–77. ^ MacDonald 1998, pp. 188, 194. ^ Leng 2006, p. 30. ^ The Beatles 2000, pp. 242–43. ^ Lavezzoli 2006, pp. 179–80. ^ Womack 2014, p. 1010. ^ Leng 2006, pp. 26–27, 31. ^ a b Leng 2006, p. 31. ^ Lewisohn 2005, pp. 103, 104. ^ Miles 2001, p. 260. ^ Lewisohn 2005, p. 104. ^ a b c Lewisohn 2005, p. 107. ^ Prendergast 2003, p. 194. ^ MacDonald 1998, p. 215fn. ^ a b The Editors of Rolling Stone 2002, pp. 175, 200. ^ Brown, Mick (19 April 1979). "A Conversation With George Harrison". Rolling Stone. Retrieved 14 August 2015. ^ Emerick & Massey 2006, p. 187. ^ a b Davies 2009, p. 321. ^ Everett 1999, pp. 111–12. ^ a b c d Fontenot, Robert. "The Beatles Songs: 'Within You Without You' – The history of this classic Beatles song". oldies.about.com. Archived from the original on 6 September 2015. Retrieved 14 March 2017. ^ a b Womack 2014, p. 1011. ^ Lewisohn 2005, pp. 114, 200. ^ Reising & LeBlanc 2016, p. 109. ^ Greene 2006, p. 77. ^ Schaffner 1978, pp. 73, 82. ^ Clayson 2003, pp. 214–15. ^ The Beatles 2000, p. 241. ^ Clerk, Carol (February 2002). "George Harrison 1943–2001". Uncut. p. 46. Available at Rock's Backpages (subscription required). ^ Clayson 2003, p. 212. ^ Reck 2016, p. 68. ^ Fleming, Colin (30 March 2017). "Beatles' 'Sgt. Pepper' Artwork: 10 Things You Didn't Know". rollingstone.com. Retrieved 13 November 2018. ^ Spizer 2003, pp. 95, 96. ^ Bagirov 2008, pp. 155, 923. ^ MacDonald 1998, p. 216fn. ^ Miles 2001, p. 268. ^ Griffiths, David (6 January 1968). "Records of the Year: The Beatles, The Beach Boys". Record Mirror. Available at Rock's Backpages (subscription required). ^ Staff writer (14 October 1967). "The Times Of India and Sgt. Pepper". Record Mirror. Available at Rock's Backpages (subscription required). ^ Moore 1997, pp. 45, 57–58. ^ Goldstein, Richard (18 June 1967). "Recordings: We Still Need the Beatles, But ...". The New York Times. p. 104. ^ Christgau, Robert (December 1967). "Columns". Esquire. robertchristgau.com. Retrieved 5 April 2016. ^ Evans, Allen (20 May 1967). "Something Different to Get the Brain Working". NME. p. 4. ^ MacDonald 1998, pp. xvi–xvii. ^ Staff writer (November 1967). "The Beatles: Sgt. Pepper's Lonely Hearts Club Band". Hit Parader. Available at Rock's Backpages (subscription required). ^ Moore 1997, p. 45. ^ a b Reising & LeBlanc 2016, p. 108. ^ Riley 1988, p. 220. ^ Riley 1988, pp. 220–21. ^ Young, Alex (22 September 2009). "The Beatles – Sgt. Pepper's Lonely Hearts Club Band [Remastered]". Consequence of Sound. Retrieved 2 August 2015. ^ MacDonald 1998, pp. 215, 231. ^ Reising 2006, p. 127. ^ Womack 2007, p. 176. ^ Ingham 2006, pp. 47, 199. ^ Prendergast 2003, pp. 193–94. ^ Unterberger, Richie. "The Beatles 'Within You Without You'". AllMusic. Retrieved 2 August 2015. ^ Moore 1997, pp. 45, 61. ^ Langager, Ross (23 November 2009). "'With Our Love, We Can Save the World': The Beatles Within and Without the Late '60s Zeitgeist (Part 2: 'Sgt. Pepper' and the Sociology of Imperial Nostalgia)". PopMatters. Retrieved 1 August 2015. ^ The Editors of Rolling Stone 2002, pp. 196, 200. ^ Gilmore, Mikal (26 May 2017). "Review: The Beatles' 'Sgt. Pepper's' Anniversary Editions Reveal Wonders". Rolling Stone. Retrieved 2 June 2017. ^ Simmons, Michael (November 2011). "Cry for a Shadow". Mojo. p. 79. ^ The Editors of Rolling Stone 2002, p. 36. ^ Lavezzoli 2006, pp. 182–83. ^ Harrison 2002, pp. 118, 119. ^ MacDonald 1998, p. 240. ^ Everett 1999, pp. 152–53. ^ Lavezzoli 2006, p. 182. ^ Hertsgaard 1996, p. 219. ^ MacDonald 1998, p. 185. ^ Doggett, Peter (2003). "Fight to the Finish". Mojo Special Limited Edition: 1000 Days of Revolution (The Beatles' Final Years – Jan 1, 1968 to Sept 27, 1970). London: Emap. p. 136. ^ Tillery 2011, pp. 151–52. ^ Jones, Nick (16 December 1967). "Beatle George and Where He's At". Melody Maker. pp. 8–9. Available at Rock's Backpages (subscription required). ^ Hermes, Will (February 2002). "George Harrison 1943–2001". Spin. p. 22. Retrieved 17 August 2015. ^ Charlesworth, Chris (3 November 1973). "Lennon Today". Melody Maker. p. 37. ^ Rodriguez 2012, p. 41. ^ Turner 2016, p. 81. ^ Lavezzoli 2006, p. 165. ^ Wright 2014, p. 43. ^ World Music: The Rough Guide 2000, p. 109. ^ Kruth 2015, p. 73. ^ Kubernik, Harvey (2012). "Ravi Interview". montereyinternationalpopfestival.com. Retrieved 22 August 2015. ^ Shankar 1999, pp. 193, 196, 198, 211. ^ Lavezzoli 2006, pp. 6–7, 180–81. ^ Robbins, Ira (3 December 2001). "George Harrison: And Life Flows On". Salon. Available at Rock's Backpages (subscription required). ^ Cupchik, Jeffrey W. (January 2013). "Polyvocality and Forgotten Proverbs (and Persons): Ravi Shankar, George Harrison and Shambhu Das". Popular Music History. 8 (1): 87. Available at academia.edu. ^ Everett 1999, p. 334. ^ Raggett, Ned. "Dead Can Dance Spiritchaser". AllMusic. Retrieved 1 November 2015. ^ a b Morse, Steve (12 July 1996). "Global Spirits: Dead Can Dance make world music mystical". Boston Globe. p. 59. ^ Planer, Lindsay. "The Rutles 'Nevertheless'". AllMusic. Retrieved 15 August 2015. ^ Huntley 2006, p. 155. ^ Lavezzoli 2006, p. 197. ^ Huntley 2006, pp. 329–30. ^ a b "Liverpool Philharmonic Presents: George Harrison 'Within You Without You' The Story of The Beatles and Indian Music". liverpoolphil.com. 5 June 2017. Retrieved 13 June 2017. ^ PTI (10 June 2017). "Uncredited Indian musicians on Beatles' album 'Sgt. Pepper's Lonely Hearts Club Band' found". The Times of India. Retrieved 13 June 2017. ^ "Mystery Indian musician on Sgt Pepper album reveals his memories after he's finally identified". The Irish News. 2 June 2017. Retrieved 14 June 2017. ^ a b Willman, Chris (17 November 2006). "Love: Music Review". Entertainment Weekly. Archived from the original on 4 December 2008. Retrieved 19 August 2015. ^ Watson, Greig (17 November 2006). "Love unveils new angle on Beatles". BBC News. Retrieved 31 October 2015. ^ "The Beatles/Cirque du Soleil 'Within You Without You/Tomorrow Never Knows'". AllMusic. Retrieved 14 June 2015. ^ Lundy, Zeth (15 December 2006). "The Beatles: Love – PopMatters Music Review". PopMatters. Archived from the original on 31 January 2007. Retrieved 4 August 2015. ^ Book, John (9 March 2007). "The Beatles Love". Okayplayer. Archived from the original on 9 March 2007. Retrieved 27 September 2015. ^ Cole, Jenni (5 December 2006). "The Beatles – Love (EMI)". musicOMH. Archived from the original on 5 December 2006. Retrieved 27 September 2015. ^ Moody, Paul (December 2006). "The Beatles – Read and have your say on the year's most controversial album". uncut.co.uk. Archived from the original on 3 January 2007. Retrieved 27 August 2015. ^ Reising & LeBlanc 2009, p. 105. ^ Holmes, Bill (10 March 2010). "All Together Now". PopMatters. Retrieved 4 August 2015. ^ Gundersen, Edna (13 November 2006). "A likely lament: 'You can't do that to The Beatles'". USA Today. Archived from the original on 25 October 2012. Retrieved 15 February 2016. ^ Irvin, Jim (December 2006). "The Beatles Love". Mojo. p. 100. ^ "The Beatles' Videos and Top Hits Come Together for the First Time". thebeatles.com. Retrieved 20 April 2017. ^ Frushtick, Russ (21 July 2009). "'The Beatles: Rock Band' Expands Its Song List". MTV. Retrieved 14 June 2015. ^ Swanson, Dave (2 October 2012). "Guitarist 'Big Jim' Sullivan Dead at 71". Ultimate Classic Rock. Retrieved 12 August 2015. ^ Unterberger, Richie. "Jim Sullivan Sitar Beat". AllMusic. Retrieved 12 August 2015. ^ Brend 2005, p. 152. ^ Goble, Ryan Randall. "Soulful Strings Groovin' with the Soulful Strings". AllMusic. Retrieved 30 September 2015. ^ Grogan, Larry (8 October 2014). "Richard Evans 1932–2014". Funky16Corners. Retrieved 1 November 2015. ^ a b Mills, Ted. "Various Artists Sgt. Pepper Knew My Father". AllMusic. Retrieved 14 June 2015. ^ The Editors of Rolling Stone 2002, p. 200. ^ Vulture staff (14 September 2007). "Our Ten Favorite Beatles Covers of All Time". Vulture. Retrieved 20 April 2017. ^ Moore 1997, p. 67. ^ Carr, Michael (2009). "Easy Star All Stars Easy Star's Lonely Hearts Dub Band". Music Feeds. Retrieved 12 August 2015. ^ Roy, Paul (3 October 2009). "Music DVD Review: Cheap Trick – Sgt. Pepper Live". Blogcritics. Retrieved 12 August 2015. ^ Lynch, Joe (22 October 2014). "Flaming Lips, 'With a Little Help From My Fwends': Track-By-Track Review". billboard.com. Retrieved 14 August 2015. ^ Loftus, Johnny. "Various Artists Songs From The Material World: A Tribute To George Harrison". AllMusic. Retrieved 14 June 2015. ^ Gottlieb, Bob. "Rainer Ptacek Nocturnes". AllMusic. Retrieved 5 October 2015. ^ "While My Guitar Gently Weeps: Your guide to this month's free CD ...". Uncut. August 2008. p. 48. ^ Downing, Brian. "Rainer Ptacek Live at the Performance Center". AllMusic. Retrieved 20 April 2017. ^ Spencer, Neil (19 March 2007). "Patti Smith, Twelve". The Observer/theguardian.com. Retrieved 22 August 2015. ^ Jones, Chris (2007). "Patti Smith Twelve Review". BBC. Retrieved 12 August 2015. ^ Verna, Paul (reviews ed.) (7 August 1999). "Reviews & Previews: Albums" > "New Age". Billboard. p. 19. Retrieved 1 November 2015. ^ Jeffires, David. "Thievery Corporation The Outernational Sound". AllMusic. Retrieved 10 August 2015. ^ MacDonald 1998, p. 214. Allison, Dale C., Jr. (2006). The Love There That's Sleeping: The Art and Spirituality of George Harrison. New York, NY: Continuum. ISBN 978-0-8264-1917-0. Boyd, Pattie; with Junor, Penny (2007). Wonderful Today: The Autobiography. London: Headline Review. ISBN 978-0-7553-1646-5. Brend, Mark (2005). Strange Sounds: Offbeat Instruments and Sonic Experiments in Pop. San Francisco, CA: Backbeat Books. ISBN 9-780879-308551. Davies, Hunter (2009) . The Beatles (rev. edn). New York, NY: W.W. Norton. ISBN 978-0-393-33874-4. Emerick, Geoff; Massey, Howard (2006). Here, There and Everywhere: My Life Recording the Music of the Beatles. New York, NY: Gotham Books. ISBN 978-1-59240-269-4. Farrell, Gerry (1997). Indian Music and the West. London: Oxford University Press. ISBN 978-0-19-816717-4. Greene, Joshua M. (2006). Here Comes the Sun: The Spiritual and Musical Journey of George Harrison. Hoboken, NJ: John Wiley & Sons. ISBN 978-0-470-12780-3. Kruth, John (2015). This Bird Has Flown: The Enduring Beauty of Rubber Soul Fifty Years On. Milwaukee, WI: Backbeat Books. ISBN 978-1-61713-573-6. Moore, Allan F. (1997). The Beatles: Sgt. Pepper's Lonely Hearts Club Band. Cambridge, UK: Cambridge University Press. ISBN 978-0-521-57484-6. Riley, Tim (1988). Tell Me Why: The Beatles: Album By Album, Song By Song, The Sixties And After. New York, NY: Alfred A. Knopf. ISBN 978-0-394-55061-9. Shankar, Ravi (1999). Raga Mala: The Autobiography of Ravi Shankar. New York, NY: Welcome Rain. ISBN 1-56649-104-5. Spizer, Bruce (2003). The Beatles on Apple Records. New Orleans, LA: 498 Productions. ISBN 0-9662649-4-0. World Music: The Rough Guide (Volume 2: Latin and North America, Caribbean, India, Asia and Pacific). London: Rough Guides/Penguin. 2000. ISBN 1-85828-636-0. Wright, Gary (2014). Dream Weaver: A Memoir; Music, Meditation, and My Friendship with George Harrison. New York, NY: Tarcher/Penguin. ISBN 978-0-399-16523-8. This page was last edited on 20 March 2019, at 22:17 (UTC).